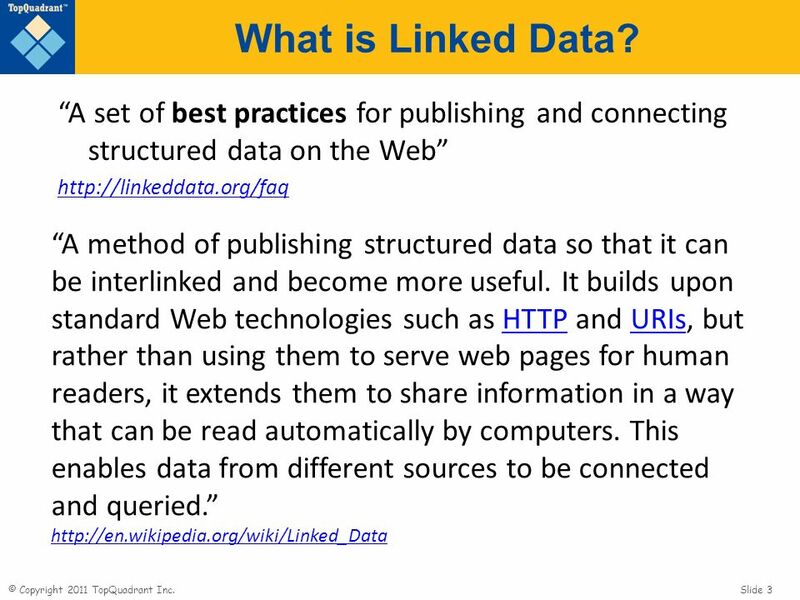 © Copyright 2011 TopQuadrant Inc. Slide 1 Evolving Practices of Linked Data Irene Polikoff, TopQuadrant June 29-30, 2011 W3C Government Linked Data Working. 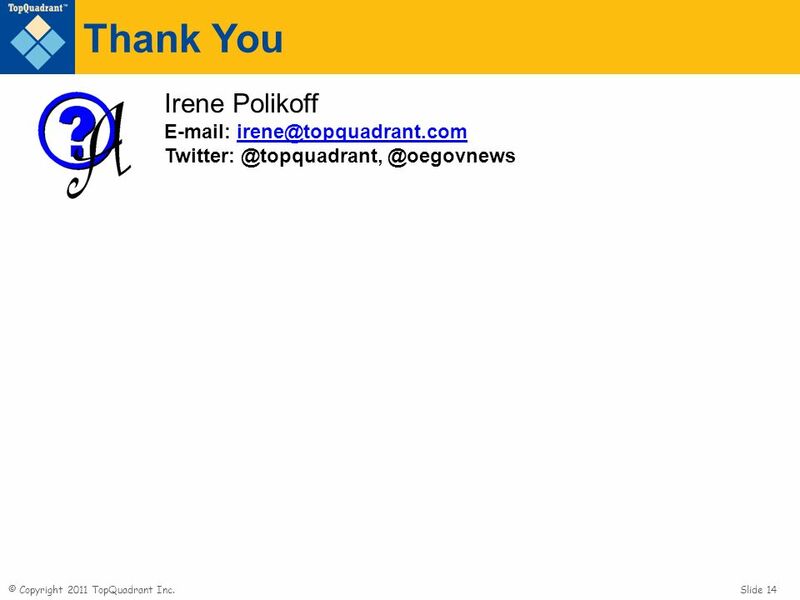 4 © Copyright 2011 TopQuadrant Inc. Slide 4 How is LD publishing being done today? 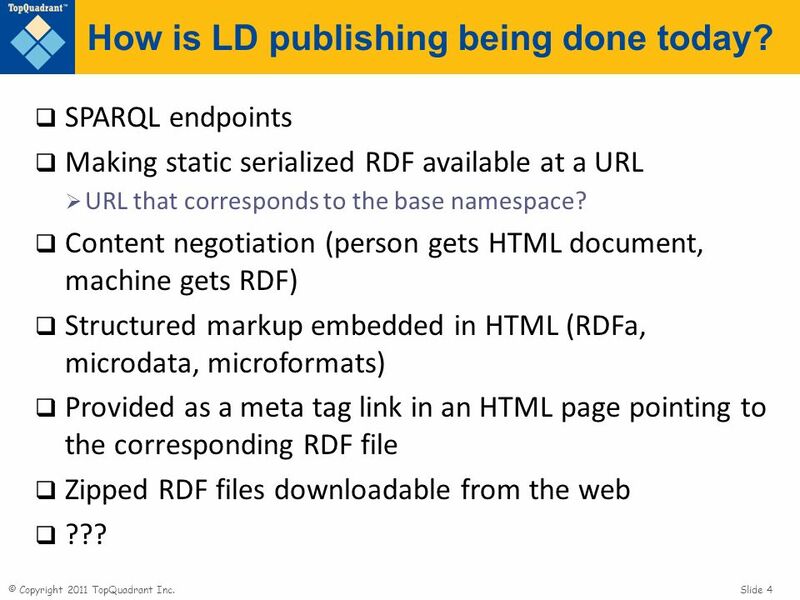 SPARQL endpoints Making static serialized RDF available at a URL URL that corresponds to the base namespace? Content negotiation (person gets HTML document, machine gets RDF) Structured markup embedded in HTML (RDFa, microdata, microformats) Provided as a meta tag link in an HTML page pointing to the corresponding RDF file Zipped RDF files downloadable from the web ??? 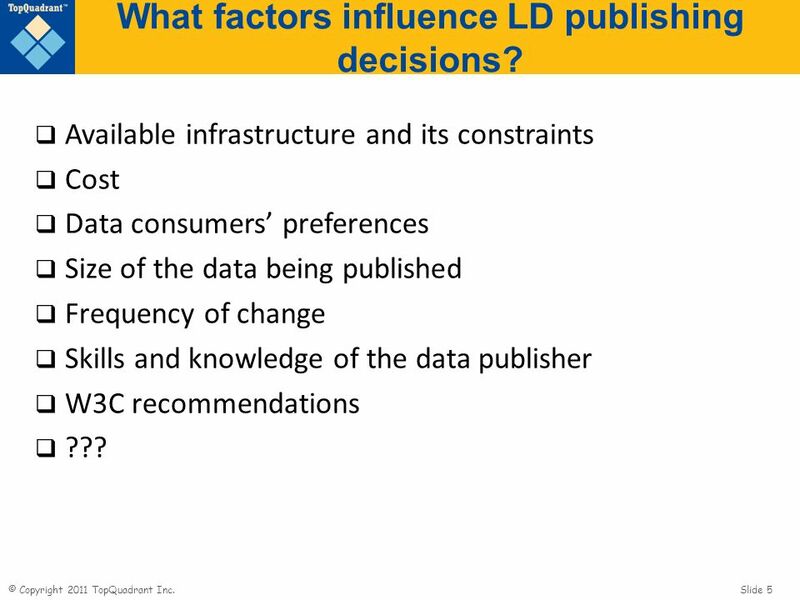 5 © Copyright 2011 TopQuadrant Inc. Slide 5 What factors influence LD publishing decisions? Available infrastructure and its constraints Cost Data consumers preferences Size of the data being published Frequency of change Skills and knowledge of the data publisher W3C recommendations ??? 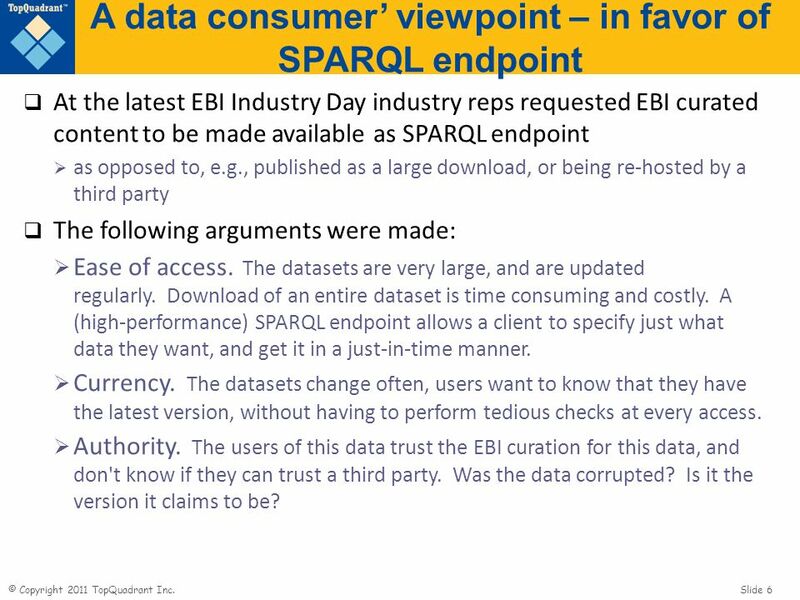 6 © Copyright 2011 TopQuadrant Inc. Slide 6 A data consumer viewpoint – in favor of SPARQL endpoint At the latest EBI Industry Day industry reps requested EBI curated content to be made available as SPARQL endpoint as opposed to, e.g., published as a large download, or being re-hosted by a third party The following arguments were made: Ease of access. The datasets are very large, and are updated regularly. Download of an entire dataset is time consuming and costly. A (high-performance) SPARQL endpoint allows a client to specify just what data they want, and get it in a just-in-time manner. Currency. The datasets change often, users want to know that they have the latest version, without having to perform tedious checks at every access. Authority. 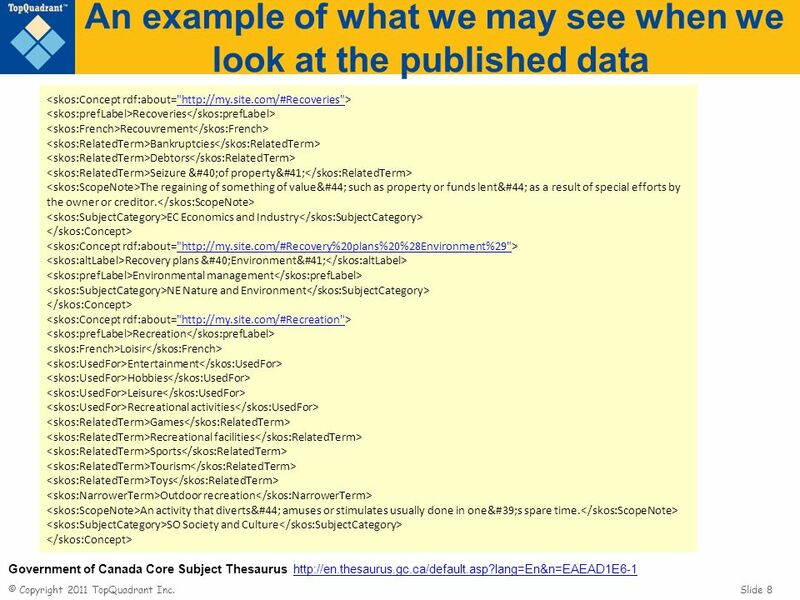 The users of this data trust the EBI curation for this data, and don't know if they can trust a third party. Was the data corrupted? Is it the version it claims to be? 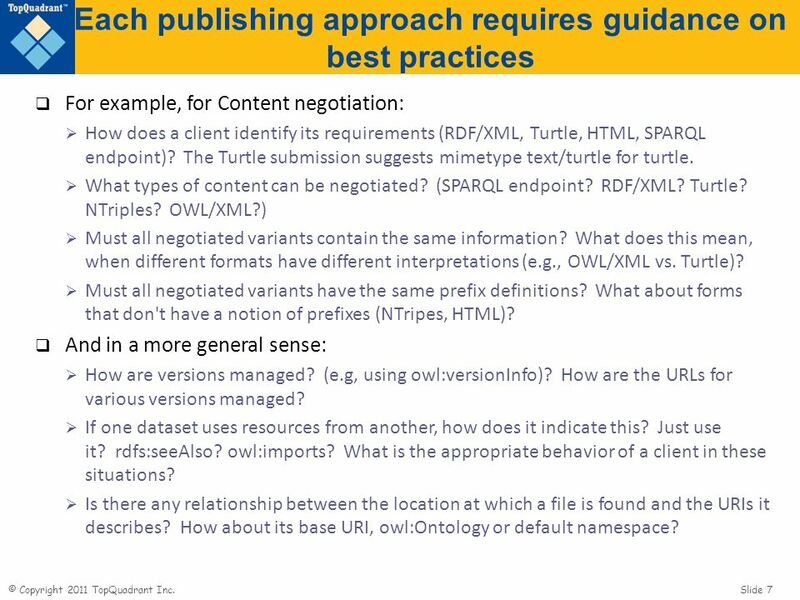 7 © Copyright 2011 TopQuadrant Inc. Slide 7 Each publishing approach requires guidance on best practices For example, for Content negotiation: How does a client identify its requirements (RDF/XML, Turtle, HTML, SPARQL endpoint)? The Turtle submission suggests mimetype text/turtle for turtle. 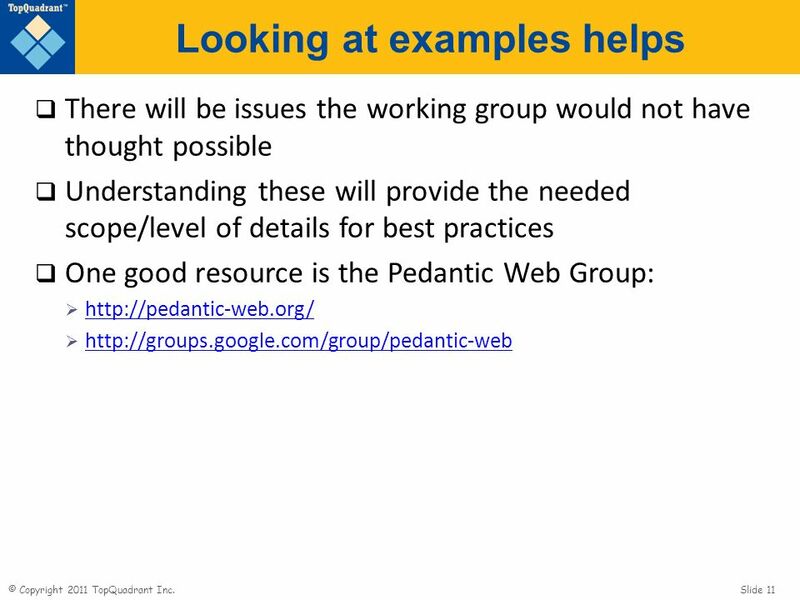 What types of content can be negotiated? 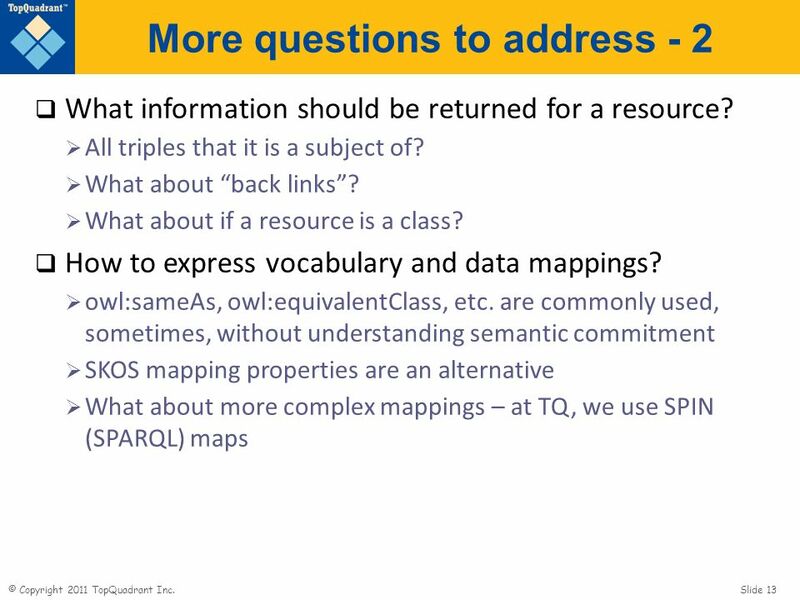 (SPARQL endpoint? 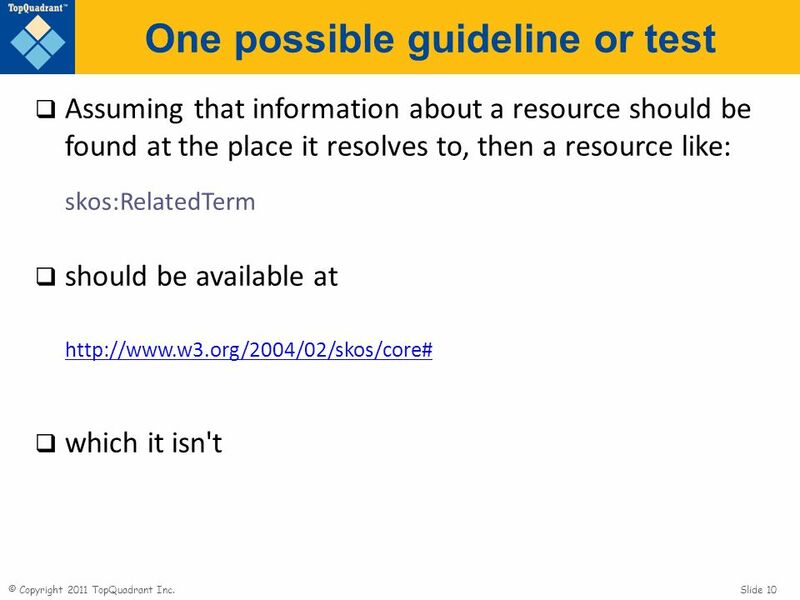 RDF/XML? Turtle? NTriples? OWL/XML?) Must all negotiated variants contain the same information? 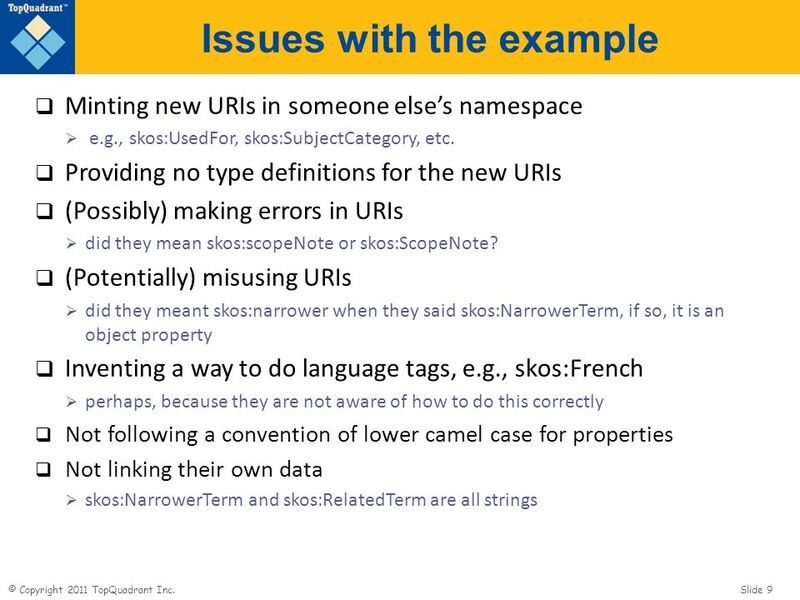 What does this mean, when different formats have different interpretations (e.g., OWL/XML vs. Turtle)? Must all negotiated variants have the same prefix definitions? What about forms that don't have a notion of prefixes (NTripes, HTML)? And in a more general sense: How are versions managed? (e.g, using owl:versionInfo)? How are the URLs for various versions managed? If one dataset uses resources from another, how does it indicate this? Just use it? rdfs:seeAlso? owl:imports? What is the appropriate behavior of a client in these situations? Is there any relationship between the location at which a file is found and the URIs it describes? 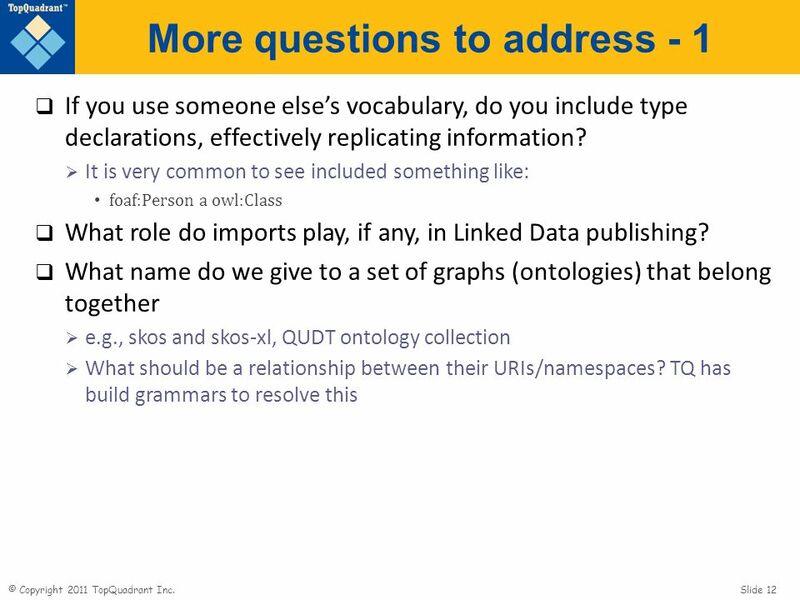 How about its base URI, owl:Ontology or default namespace? 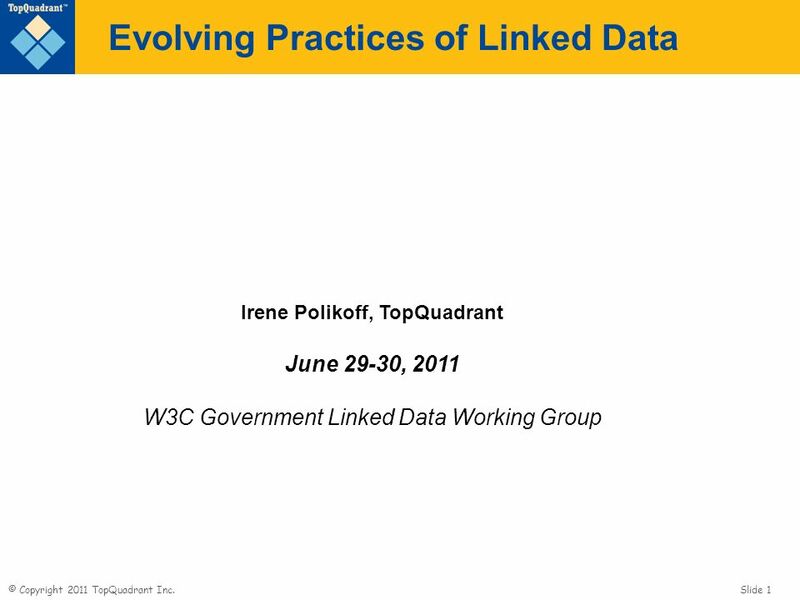 Download ppt "© Copyright 2011 TopQuadrant Inc. Slide 1 Evolving Practices of Linked Data Irene Polikoff, TopQuadrant June 29-30, 2011 W3C Government Linked Data Working." Interoperability and semantics in RDF representations of FRBR, FRAD and FRSAD Gordon Dunsire Presented at the Cologne Conference on Interoperability and. 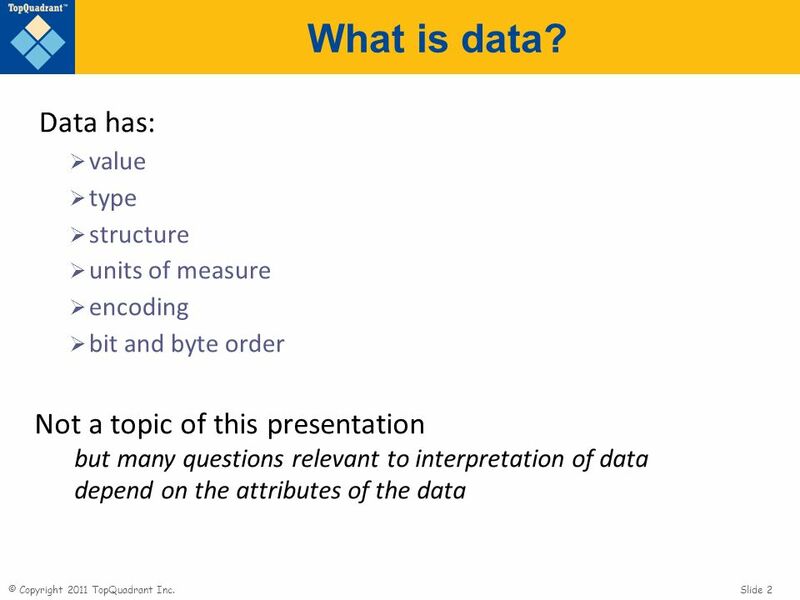 © Copyright 2009 TopQuadrant Inc. Slide 1 QUDT: An OWL Ontology for Measurable Quantities, Units, Dimension Systems, and Dimensional Data Types James Chip. Resource description and access for the digital world Gordon Dunsire Centre for Digital Library Research University of Strathclyde Scotland. XPointer and HTTP Range A possible design for a scalable and extensible RDF Data Access protocol. Bryan Thompson Presented to the RDF Data Access. XPointer and HTTP Range A possible design for a scalable and extensible RDF Data Access protocol. Bryan Thompson draft Presented to the RDF. Last update: (2) (3) The Dutch airline.